If today was anything to go by then it is time to invest in linen knitwear and to go sockless for the foreseeable future. Spring was shinning in all its glory in Dublin. Last spring-summer we had our prints and bold colours. It's time to move on. It's time we refine our past experiences. I have always been a fan of the saying less is more. Don't get me wrong, I love to stand out, but sometimes I think simple colours and subtle patterns help to communicate your own sense of style and I think that will be key for men's style in the coming months. Designers seem to be going through their old wardrobes and pulling out their traditional patterns and fabrics and trying to work them into the modern day. Blazers are one thing I am not short of so I will certainly be trying to rework some of them into my spring outfits. It's just a shame they don't look as good as this one. I always wished I could pull off a hat. Unfortunately my head is to big and I look ridiculous with one on. That and I don't want to ruin my hair. 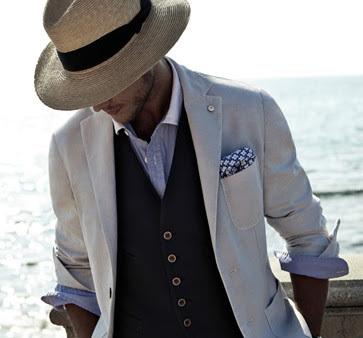 All fun aside, it's time to forget those stingy straw fedoras from last year. Go out and get the whitest and widest fedora you can find. The sun shinning is always a valid excuse to invest in some pastel pieces. They suit nearly every guy and look great so win, win. Once they are paired with a more neutral piece then you are set. Accessories can simply complete your look. It doesn't necessarily have to be a certain pattern but i find accessories like a tie, scarf or my favorite a dicky bow, can look both simple and sophisticated. So there you have it, just a few quick tips for the coming months. I know it's not every guys cup of tea but its fun to try something new every now and again.